Not just a boat, the Steamboat NATCHEZ is a time machine that fills its passengers with the romance and marvel of yesteryear! 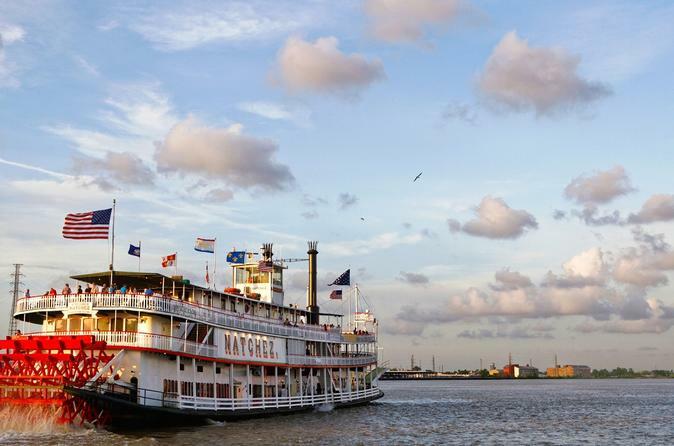 Cruise along the Mississippi River and let the Steamboat NATCHEZ whisk you away with its atmosphere and ambiance, with everything from a museum- quality Engine Room to the ship's orders being called over an old-time megaphone. This evening jazz cruise is a great way to experience New Orleans' beauty and culture. As you steam ahead, soak in breathtaking views of the city skyline while enjoying a New Orleans cultural experience – a live jazz performance performed by the New Orleans band Dukes of Dixieland, a Grammy nominee. Enjoy dining inside or outside on a delectable Louisiana-style buffet dinner including prime rib, chicken, pasta and salad. Two separate dining times give you the flexibility to enjoy the evening at your own pace. A sample dinner menu can be found in the Itinerary section below. Please Note: The price displayed is based on the cruise only option. Cruise with dinner option must be selected in order to confirm that your cruise includes the meal.